For three centuries the Carter family has made their way of life in the rolling landscapes of Fauquier County, which is located in the Virginia Piedmont. 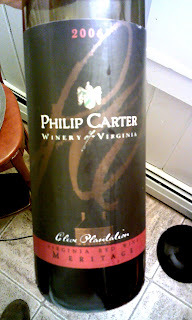 "Philip Carter Winery is on the site of the former Stillhouse Winery, but the wines are far superior to those of Stillhouse. New owner Philip Carter Strother, a Richmond attorney, is a descendant of Virginian Charles Carter, who by 1762 had 1,800vines under cultivation and was making wine at Cleve Plantation on the banks of the Rappahannock River. In the first international acknowledgment of winemaking in America, an official London group awarded Carter a gold medal for his efforts. This was more than 40 years before Thomas Jefferson made a serious foray into grape growing and wine production in the state," reported the Richmond Times Dispatch in 2009. 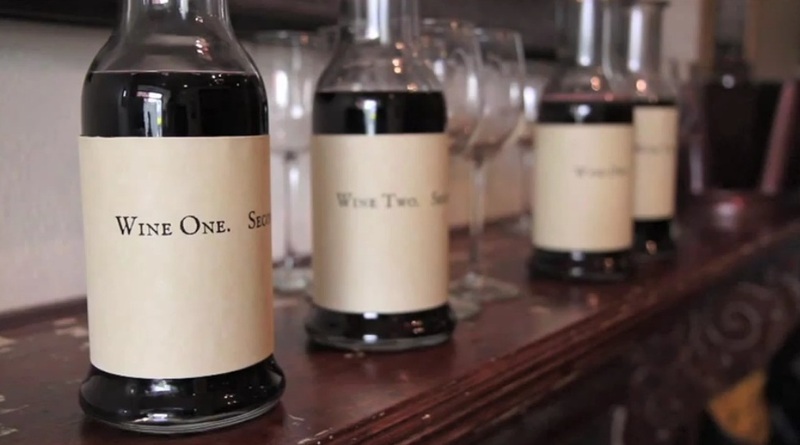 The is a medium bodied red wine is made from Cabernet Franc, Merlot and Cabernet Sauvignon. Big nose of cherry and cranberry mixed with vanilla and cedar. A European-styled wine with complex aromas and flavors. Fantastic! I am Richard Leahy's editor at Sterling Epicure. I also want to acknowledge Diane Abrams, the senior editor there, and Mary Hern, editor, both put a lot of time into this project. I feel compelled to write about this particular book because East Coast Wineries, and Virginia in particular, are my normal realm of coverage. I have reviewed other books on East Coast wine, and more reviews are due. This book, in particular, falls into the wheelhouse of the editorial concerns of this blog, and thus it would be odd for me to not review or say something about this book. That said, this is more a letter from the editor than it is a review. For 30 years, Thomas Jefferson grew grapes in his Monticello vineyards in hopes of producing fine wine—but to no avail. Today, that has completely changed. Virginia Wines have never been hotter, with markets now evolving in the U.K. and the Far East. From Wine Enthusiast Magazine—which recently named Virginia one of its top ten wine destinations for 2012, to Wine Spectator, the New York Times and the Washington Post, everyone is raving about Virginia wine. Some of the world’s foremost oenophiles, including Jancis Robinson, Kevin Zraly and Dave McIntyre, have all endorsed Virginia as a promising new wine region. Virginia’s wines now have a reputation as some of the best in America, with increasing sales and more wineries (over 200) welcoming an ever-larger number of visitors. 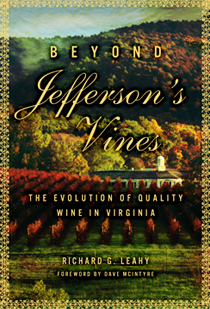 Now, with his forthcoming title Beyond Jefferson’s Vines, (Sterling Epicure/May 1, 2012) Richard G. Leahy, has written the essential book on Virginia wine, covering its history, interviews with the state's top winemakers, and updates on the latest industry developments. Why Virginia wine? Well, it's one of the fastest growing wine regions in the country. In the last five years, the states number of wines has almost doubled. It has six or seven bloggers who cover its wine industry. It has a state government that has embraced the industry. The state's First Lady has made it her personal mission to promote the industry. The state of Virginia has awarded $4.5 million to help promoting wine and tourism. And it has a fantastic wine promotion director in Annette Boyd, one of the most social active wine region directors in the entire industry (her and Morgen McLaughlin). 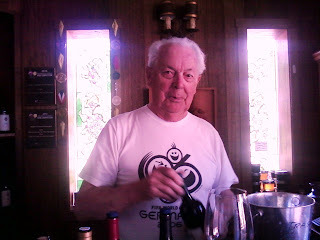 They also have a dedicated exporter who has established their wines in the UK quite successfully. And most importantly? Virginia is making fantastic wines. From light crisp, complex whites like Chardonnay, Viognier and Petitie Manseng, to Norton, to Cabernet Franc, to Petite Verdot, to Meritage blends, the wines, one after the other, are fantastic. There are passionate people making wine in Virginia. And now finally there is a book that highlightes them, their devotion to making great wines, and their stories. The book gives you an insider’s tour of the Virginia wine region, from its early days when Thomas Jefferson established his vineyard at Monticello to a place where yet another new revolution is brewing today—that of great wine. It focuses on the last thirty years but also sheds light on previously unexamined chapters of the eighteenth-century Virginia wine experiment. You’ll see the vast diversity of Virginia wine, from large wineries to brands without wineries that hire custom-crush facilities to make the wine for them. This is the single best book on what is happening in Virgina wine today. It chock-a-block with the people, the places, and the things that are catapulting this region into a whole new level. The last time I was down in Virginia, I had visited Chris Pearmund winery and the Winery ay La Grange. But Paradise Springs was closed that day. I was disappointed, for I had heard great things about it. Unfortunately, I drove all the way there only to find out that they weren't open. My bad. I sat cursing the fates, sitting in my car, fighting with a folding map of Virginia wine country, and figuring out hwere I would go to sauve my grumpy condition. But just yesterday I had the opprtunity to sample their wines. Hoorah!!! 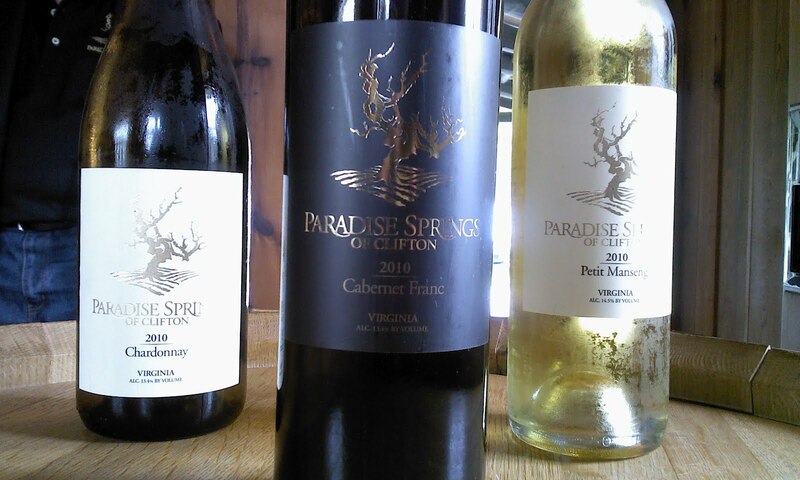 The site of Paradise Springs Winery lies on 36 acres nestled in the quiet corner of Clifton, VA on the edge of Fairfax County. The property borders Hemlock Regional Park with the Bull Run River flowing only steps through the woods. 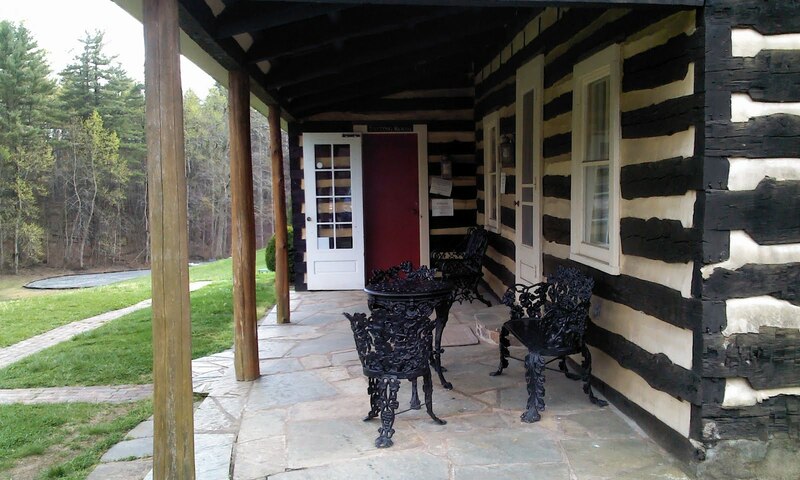 Originally, the property was part of a one-thousand acre land grant from Lord Fairfax in 1716 to the family’s direct ancestors and has been passed down through the generations since. Several hundred acres still remain in the family today. The road the wienry is situated on a long, winding road, with my hills and dips, and twists and turns, filled with large homes, many mansions, with rolling hills, and horse pastures, and lots of big, gorgeous trees. A perfect country drive. Perfect!Beautiful! 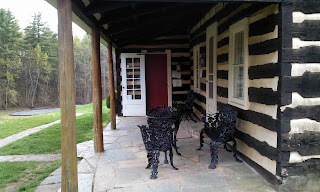 The original log cabin (which is the only part of the winery you can see from the road) is estimated to have been built between 1800 and 1825 as there is no record of the exact date. In 1955 the property undertook a major renovation led by Howard Richter, a protégé of the great Frank Lloyd Wright. Another wing was added to the original cabin that includes a kitchen, bathroom, plumbing, and electricity. The original foundation was reinforced and transformed into a cellar complete with a built-in wine rack. More than 20 years ago, Jane and her Aunt, the late Esther Kincheloe Podolnick, had a conversation about how the property would make the perfect backdrop for a winery. That conversation resonated throughout the years and with the recent assent of the Virginia wine industry, the idea once again took off. 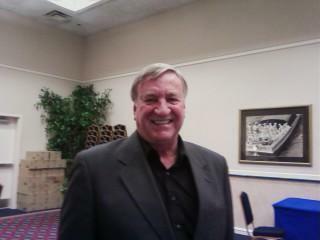 Jane’s eldest son, Kirk Wiles, recognized the opportunity and offered to take the reins on the project. 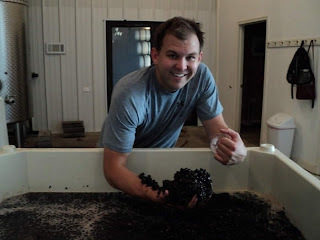 As a graduate of the University of Miami, Kirk moved back to Virginia in 2004 and started connecting the dots in putting together what would be Fairfax County’s first and only winery. In 2006 they met Chris Pearmund, an acclaimed winegrower and vintner in Virginia, who offered to serve as Consultant and Executive Winemaker to help guide them towards opening the winery. The first vintage was actually produced at the Winery at LaGrange. They also brought on board experienced wine maker Rob Cox. Paradise Springs Winery was founded in 2007 as a family business and their first vintage was crafted that fall, a Reserve Cabernet Sauvignon. In April 2008, the first vineyard, comprised of Cabernet Franc, was planted on the west end of the property and has since seen exceptional growth due to the rich fertile soils within the Occoquan Watershed. However, the local planning board tried to effectivley kill the project, deeming winemaking an industrial capacity not an agricltural endeavor, thus halting the burgeoning winery from opening. Jane and Kirk turned to Philip Carter Strother of Strother Law Offices in Richmond, VA to help right the ship. Philip, also a fellow winery owner of Philip Carter Winery, lead the charge in and out of courts for the next year and a half. On September 3rd, 2009, a decision came down from the Virginia ABC Board proclaiming Paradise Springs Winery’s right to operate and effectively issued their license. The determination was appealed by a few disgruntled neighbors but ultimately was upheld and the winery opened its doors for business on January 16th, 2010. 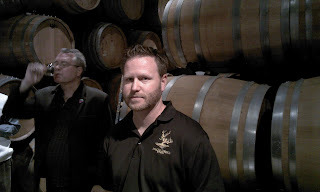 The head winemaker is Rob Cox, who is also aided by asistant winemaker Michael Ching. Both are friendly, affable, and down to earth. Cox has made a rapid ascent in the wine world, and the results show why! He started out at Narmada Winery, and then went to Philip Carter. During that entire time he was also consulting winemaker to Paradise Springs. He is chatty and pleasant, never talking down to the many visitors who come through their doors. On the day I visited, Cox and Ching it seemed were as much a part of the sales effort as the tastingroom team, working the room, chatting with customers, and doing endless barrel tastings, and rounds of group tastings. Cox is happy to tell you about how they made each wine. Why they used this or that oak, and what kind of toasting, and why. Ching is also chatty, and ably fills in with elan when Cox is called away. A great team! We tasted three wines form the 2010 vintage. 2010 Petit Manseng - This is one mf my new favorites. This is not your typical varietal white. It's a medium bodied wine with a whopping 13.9% alcohol. It's very much like Viognier, in that it has a huge nose - with a big floral bouquet. The mandarin orange, tangerine, and the hint of peach all came through as promised. It smelled like it would be a sweet wines, but the final product was a delicious dry wine with great flavor on the palate, with lots of fruit, but ended dry. This is among my new favorite whites! 2010 Chardonnay - This is a wonderful barrel fermented and aged in light French oak for 9 months sur lie. Cox discussed he didn't want to over oak the wine, and so that was why they used the lightly toasted oak. It worked perfectly. Normally I prefer a stainless steel, but here the oak was used with a light touch, and the resulting wine shows a delicate flavor with lovely bright fruit, and a nice soft finish. Big hints of Granny apples, and a light touch of oak bring a soft whisp of vanilla. Fantastic! 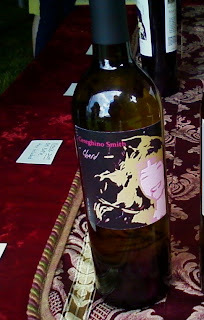 The 2009 Vintage was winner of the VA Governor's Cup for the "Best White Wine in VA". 2010 Cabernet Franc - Estate grown at Paradise Springs. This is a medium-bodied Cab Franc, slightly more Burgundian in style than something from like the North Fork of Long Isalnd or most other Virginia wineries (such as Winery at la Grange or say Boxwood). But the resulting wine is impressive. A transulcent dark garnet, the wine has wonderful plum and raspberry flavors up front with a nice but not overpowering touch of vanilla from French Oak. It had a wonderful mature flavor, with big fuit and wonderful acidity and low tannins. An excellent food wine. 2011 Petite Manseng - Light, crisp, fowery, delicious! 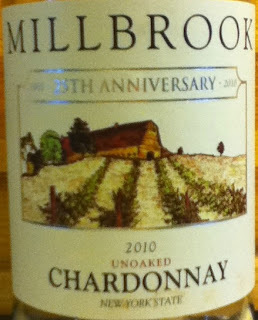 2011 Chardonnay - Incredibly delicate. Light, stylish, but just an great expression of fruit with a lovely, light Burgundian touch....impressive! 2011 Cabernet Franc - Lighter than the 2010 but what an amazing nose. It was jam packed with red raspberry jam and plum, with hints of vanilla. It smelled like fresh baked raspberry cobbler. Soft and delicious! Incredible! 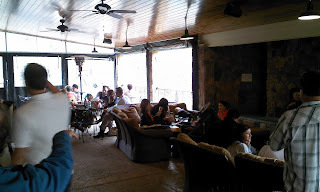 The other fantastic thing about Paradise Springs is that the tasting room is big and gorgeous, and the outside deck is easilly only one or two of the most tremendous outside tasting rooms I've ever seen (the other is Bedell's outdoor tasting room in Long Island). Complete with fireplace, ceiling fans, and heat lamps, one could sit outside in summer or fall. Filled with big couches and ottomans, it looks like a Frontgate catalog with extra appointments from William-Sonoma. It was fantastic...and it was jammed with folks enjoying the crackling fire and the smell of buring wood. You simple have just got to go and expereince it for yourself. August 16th 2010, Randy and Meagan Morgan became the newest stewards of a great tradition and one of the most well known wineries in Virginia. The first vines were planted on this site in 1976 by Bob and Phoebe Harper, who were led here by the theory, “If you can find a place peaches will grow, grapes will grow too.” It started with four rows, but over the years grew to 6 acres producing over 6,000 cases annually. With Chardonnay that has been served at the White House twice (once during a State Dinner hosted by President George H. W. Bush, and again at a meeting with State Governor’s held by President Bill Clinton) the Harpers built a tradition of high quality wines accompanied by spectacular views. I came across a bottle of Naked Mountain Raptor Red 2008 at the Eastern WIneries Exposition in Lancaster, PA. Obviously, someone Randy and Meagan were there, though we never met that I know of. Raptor Red is a blend is approximately 31% Tannat, 30% Merlot, 20% Petit Verdot, 19% Cabernet Franc (this is an approximation from the 2007 vinetage). All of the grapes were harvested and chilled in a refrigerated trailer overnight. The subsequent mornings the grapes were destemmed, crushed and were allowed to cold soak for a few days in one ton bins where they were punched down at least twice a day. Each red wine must was inoculated with BM45, D80 or D254 yeasts. Following fermentation, when all of the grape sugar was converted to alcohol, the wine was concurrently inoculated with malolactic bacteria while it was pressed into stainless steel tanks. Malolactic fermentation, a second, bacterial fermentation is where the malic acids are converted to softer lactic acids. Following 24 hours of settling the wine was racked into barrels where it would spend the next 10 months. The wine was stirred weekly for two months and then monthly for eight months. Stirring, or Sur Lies aging, introduces the lees back into the juice to enhance the structure and mouth feel of a wine, give it extra body, and increase the aromatic complexity. Lees also absorb oxygen, and help maintain a slow and controlled oxidation during maturation. Lees stirring increases the release of yeast compounds into the wine, resulting in the creamy, viscous mouth feel of our Raptor Red. Stirring also helps integrate the wood or oak characteristics into the wine. The wine was wonderful! Lots of dark berries and cocoa came forth from the glass. And a whiff of vanilla. Once on the palate the dark berries came through - dark raspberry, black cherry, and hints of cassis. Good fruit up front, nice acidity and low tannins. This was a wonderful wine and a lot of fun! Very, very good! Excellent! Editor-in-Chief Gregory Dal Piaz recently raved about six Hudson Valley wines. Here's what he has to say, with the links to prove it! Watch the Vitrual Tasting on Wednesday, March 21, 2010 at 8pm. Michael and Patricia Kavic have known each other along time. Since their college days. Michael completed medical school and became a general surgeon. His wife, Patricia Fleck Kavic, who is a registered nurse, completed graduate studies in social work and practiced in the field. Together, they started Michael Stephen Kavic Winery. 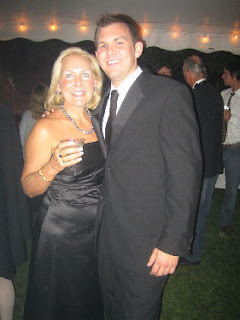 Patricia's brother, Patrick J. Fleck, Jr., joined them last year as Manager of Operations at the Winery. The winery is urban, located within 10 minutes of downtown Pittsburgh. All their grapes are locally grown, using local labor and local products. Their own vineyard, under development, will be within 5 miles of the winery. Until then, they make wine with the grapes they can get. 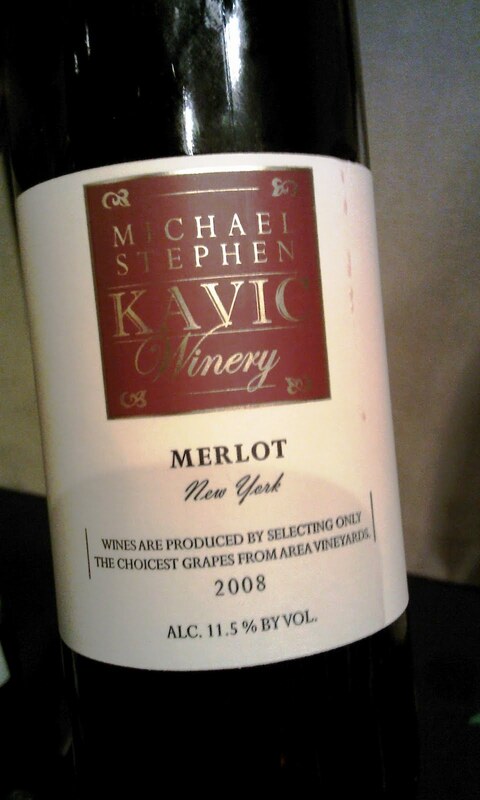 Michael and Patricia Kavic make quality wines. 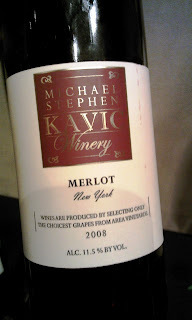 I had the oppotunity to try their 2008 Merlot New York. The grapes were grown in New York. But the wine was made in Pennsylvania. The merlot was a dark, dry red wine. The nose was pregnant with plum, ripe cherries, and a hint of chocolate. The fruit on the palate was defintely cherries, plum, and again the subtle hint of mocha. The fruit and acids were balanced, and the finish was soft with low tannins. I'm posting yet another set of commentary reprinted from Jim Trezise, President of the NYWGF. This program is exactly what New York wine needed. I hope the foundation will plan another one for next year. Big kudos to Jim Trezise!I've also included two posts from the New York Cork Report, just to show the impact this program had. Again, congrats to the whole NYWGF team! 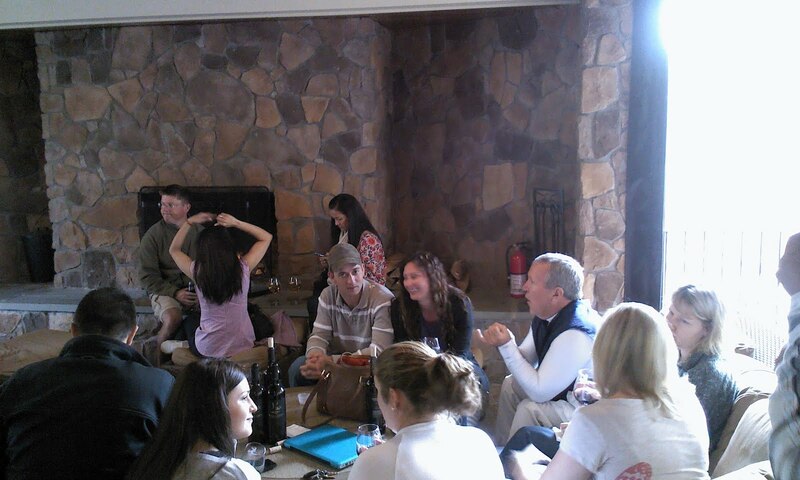 And to the wineries for particpating. "This was by far the best New York wine tasting I have ever attended"...Way beyond my expectations"..."Gangbusters, awesome!"... "Too good to be true, this is unbelievable." Those were typical comments during last Monday's Grand Tasting at Astor Center in lower Manhattan, with the comments coming from winery owners, the trade and media representatives. Expertly orchestrated by our colleagues at First Press Public Relations, the afternoon began with a private seminar on "Aromatic Whites" for 25 media and trade, followed by an afternoon-long tasting for the same audiences, and finally a consumer tasting--with huge crowds all day and evening. One winery owner said he and his winemaker were constantly pouring and didn't even have five minutes for a break the entire day. The trade and media portion drew 217 sommeliers, wine store buyers, and wine writers, with 260 consumers making total attendance 477. As important as the quantity was the quality of attendees, like sommeliers Aldo Sohm (Le Bernadin), Paul Grieco (Terroir and Hearth), Dustin Wilson (Eleven Madison Park) and Andre Compeyre (Benoit). Top-level retailers included Valerie Corbin (Astor Wines), Ben Wood (67 Wines), and Jesse Salazar (Union Square Wines). Influential members of the media were also out in force, including Josh Greene (Wine & Spirits), Lettie Teague (The Wall Street Journal), Dana Nigro (Wine Spectator), Howard Goldberg (The New York Times), Mary Mulligan, Anna Lee Iijima (Wine Enthusiast), Betsy Andrews (Saveur), Tyler Colman (Dr.Vino.com), Talia Baiocchi (Eater/San Francisco), and Amy Zavatto (Imbibe, Edible), among many others. Many of the retailers and restaurateurs were there not just to taste, but also to do business on the spot. One winery owner showed me a bunch of business cards of retailers who actually ordered wine--which very rarely happens at events like this. Meanwhile, outside were taxis with our "NYDrinksNY" ads on their roofs. This overall program, from the market research to this final event, spanned three months of intense work and was made possible by a grant from the Genesee Valley Regional Market Authority. That money is now gone, and whether we're able to find more will determine if this great promotion will have been just a flash in the pan or the beginning of serious New York wine marketing in New York City. WHYY: New Jersey Vs. France: The Judgement of Rhittenhouse Square! Great piece here on the quality of New Jersey wines. They've come a long, long way. 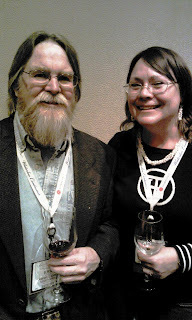 Hat's off to Keith Wallace, Director of the the Philadelphia Wine School. Great job! Absolutely love what he's doing! If you've ever been to a winery in New Jersey, chances are you've heard this: "Our soil and climate is so similar to ... Bordeaux, France. They deal with the same things we do. And our wines actually drink very similar." That's Richard Heritage of Heritage Vineyards in Mullica Hill. So many people have told me this — it's a pretty big part of the New Jersey wine narrative. And, you know, I could fact-check it — compare the humidity levels in the summer and the amount of rocks in the soil between the two regions. But I thought there might be a better way. 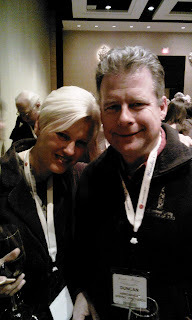 So, I called Keith Wallace, the executive director of the Wine School of Philadelphia. And he agreed to host a blind tasting. Without cutting any corners. "I made sure that the wines were comparable — to the point of totally geeked-out — making sure the barrel programs were the same and making sure the region was fairly similar," said Wallace. "And making sure the economic status of the wineries was similar, because that's what really matters." Wallace says, give him enough money, and he could make a good wine in Newark. But that's a competition for another day. against European vintages? Tell us below. For now, four of us tasters will try three flights, or rounds, of two wines each. In each flight, one wine from Jersey and one from Bordeaux. To my right is Jennifer Malme, a wine and food blogger for the site Jersey Bites. "I'm not super experienced," she said. "But I know a little bit more than a novice." I'm the novice here, representing the "normal people" opinion. Frank Cipparone, further down the table, is a little more knowledgeable. He's a longtime wine reviewer and educator. His secret? "You have to drink a lot," he said. "Seriously." He sips his wine, now on the second flight. "I don't know about you, Zach, and you ladies, but the second one was so monotone for me." Zach Morris, on the end, agrees. He's an instructor here at the Wine School, and thinks New Jersey has a fighting chance today. "There's a stigma with New Jersey not just with wine but with everything," he said. "That's not in the glass. That's an outside factor that doesn't mean anything. It doesn't have a bearing on what kind of pleasure the wine induces. So, why not New Jersey?" Well, if there is a good reason, we're about to find out. Wallace collects all of the scorecards and tells us that, in all three flights, wine No. 1 was voted the best. He then, with some effort, opens the twice-sealed results envelope. "First flight: Wine No. 1, the winner was French. Second flight: Wine No. 1 was French again," announced Wallace. "However, wine No.1 from the third flight was actually Chateau Amalthea from New Jersey." That's a 2008 Merlot Cabernet Franc blend from Amalthea Cellars in Atco, Camden County. And there's no gasping. Everyone agrees: All the wines were good. Better than good, even. But there is an interesting twist. At the bottom of each scorecard, Wallace asked "Where do you think this wine is from?" And everyone answered the same. "Whatever you voted for, on average — the one that you preferred the most — you thought was French." Why not New Jersey? When it comes to wine, even we Americans apparently are French snobs. See below for The Judgement of Rittenhouse: New Jersey vs. France blind taste test wine list and results, flight by flight. Never heard of Seven Mountains? Well, if you live anywhere else besides Pennsylvania, get in line. But if you live in Pennsylvania, you must be living under a rock. Seven Mountains Wine Cellars has been on a massive roll, winning two Governor's Cups at the 2011 PA Farm Show and also taking home a third Governor's Cup at the 2012 PA Farm Show giving them Back to Back Governor's Cups! Scott Bubb, the winemaker and co-owner along with his wife, is a Mifflin County native and still lives close by in southern Centre County. Born in Lewistown, he grew up in Lumber City (a suburb of Reedsville), and graduated from Kishacoquillas High School in 1974. At the age of 17 he started a nearly 35-year career in manufacturing at New Holland in Belleville, Pennsylvania. In October 2007, the announcement came that corporate management decided to close the Belleville plant. After hearing the bitter-sweet news, Scott decided to pursue the career that he longed for. 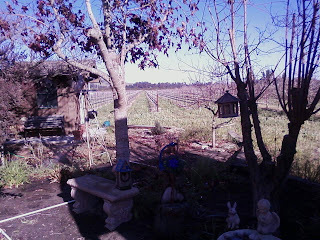 He would leave the world of amateur winemaking, go professional, and open a winery with his wife Mary Ann. Winemaking has been a part of Scott’s life since 1976. 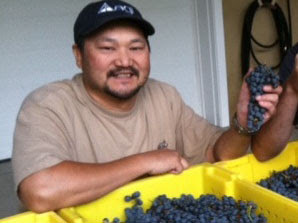 He made his first wine from Concord grapes that he picked from his Aunt Sylvia’s backyard. This first try wasn’t what he had hoped for, but it wasn’t all that bad either. Since that day, he has had a strong passion, almost an obsession, with trying to produce the highest quality wine that he possibly can. His Father once told him “If the job isn’t worth doing right, it’s not worth doing at all.” He has lived by that advice for many years. 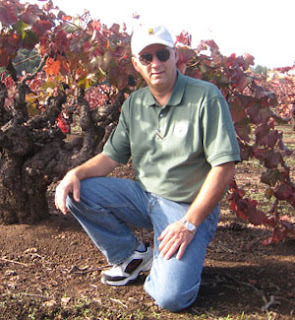 He has garnered many awards at both regional and national Amateur Wine Competitions, and in 2008 when he decided to make the move to commercial wine making, he was ranked 12th on the American Wine Society's list of the top 50 Amateur Winemakers in the United States. Seven Mountains Wine Cellars is located between Lewistown and State College, Pennsylvania, in Spring Mills, Pennsylvania. 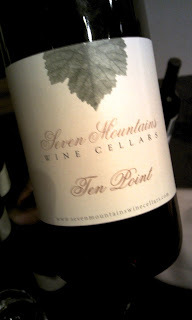 Recently I tried their Ten Point is a Bordeaux blend of Cabernet Franc, Cabernet Sauvignon and Merlot. This was a big lush wine, with exceptional garnet color and ripe red cherry and soft dark raspberry, with a hint of cassis and a whiff of vanilla. The wine was very drinkable, with nice acids, and relatively soft tannins. What a nice surprise, and what a sophisticated wine. Defintely can be counted among the better red blends of the east coast. Another blue ribbon for Scott Bubb and Seven Mountains! If the Hudson Valley is the closest thing New York state has to the Burgundy region (and I would posit that is being recognized as that more and more), then one needs to consider the white wines of the valley. The valley produces a wide range of white wines from Tocai Fruliano to Seyval Blanc, and others. But the most direct correlation to Burgundy styled wines of the whites is Chardonnay. Chardonnay has really started to take hold here in the valley, and it is proving to be a great and credible region, with some incredible characteristics. The valley was formed thousands of years ago, when the receding Wisconsin ice sheet gouged a deep ravine up the eastern border of what is now New York state, not far from its New England neighbors, Connecticut and Massachusetts mainly. As it withdrew its icy hand, scratching like fingernails on chalkboard over the state’s northbound rocky spine of the Catskills, it deposited river rocks all along the many farms on both sides of the river. The terroir of the Hudson Valley is then mostly large and medium round river stones, slate, and some clay. Other compounds emerge from vineyard to vineyard, but these three elements are never very far. A common joke amongst Hudson Valley vineyard owners is that they grow rocks better than anything else. One of the things many of the region’s best chardonnays have in common is a certain minerality. Whether the vintners do a stainless steel version, with lots of fruit and mineral, or a more complex, Burgundy styled white, made left on lees, with a malolactic touch of creaminess, and hints of toasty oak, these wines come from a place. Using Matt Kramer’s term, they have a “somewhereness” to them. 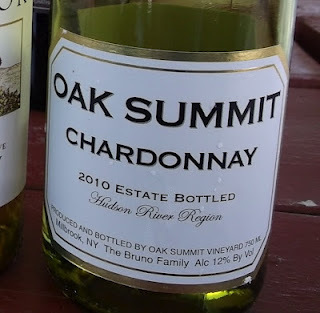 The best chardonnays of the valley, hands down are: Oak Summit Chardonnay, Millbrook Chardonnay, Tousey Chardonnay, Whitecliff Chardonnay, Cereghino-Smith Chardonnay, and Brotherhood Chardonnay. No order is implied here. These are wines that have won major awards or have gotten review attention from major media and received excellent scores. These are the ones the experts have raved about. Places like the New York Times, the Wall St. Journal, and other newspapers and magazines. These chardonnays are made with complexity and a drinkability that begs for seafood, whether its shellfish or trout almandine, fresh Hudson Valley artisanal cheeses, salads, soups, a great risotto, or a hot herb-roasted chicken. Served slightly chilled, these whites show big fruits up front like green apple, apricot, honeysuckle, melon and other classic characteristics. The best of them, like the ones above, have a delicateness that makes them elegant, nuanced, and refreshing. I can’t pretend to have tried all the other chardonnays in the Hudson Valley, as much as I would like to. Upon searching, there are more Chardonnays than even I expected. And many of them are very good (I’ve tasted a bunch) and very, very drinkable. Chardonnay is in fact the most widely produced white wine in the valley. The Oak Summitt, Tousey, and Millbrook were grown on the east side of the river not far from each other, and have big, lovely fruit forward characters, but delicate flavors and beautiful finishes. 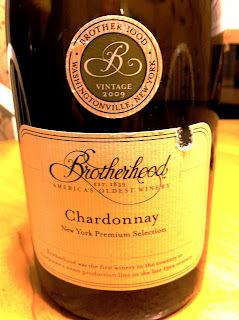 And the Brotherhood chardonnay, though made on the west bank of the river, is actually grown on the east side north of Tousey in Columbia County. Tousey’s future chardonnays will also come from that same vineyard. The Whitecliff is estate grown, and a delicate, flinty white dry wine with wonderful acidity and elegance. And the Cereghino-Smith is blended with a hint of Viognier, giving it a wonderful nose and tremendous fruit forward profile, with a clean, crisp finish. 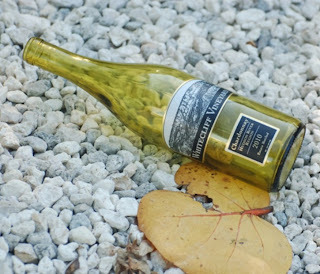 Other quality wines include Robibero Chardonnay, Palaia Chardonnay, Warwick Chardonnay, Hudson-Chatham Chardonnay, Ledge Rock Hill Chardonnay, El Paso Chardonnay, Basha Kill Wood Duck, Clearview Chardonnay, and Pazdar Chardonnay. I strongly recommend you try a Hudson Valley chardonnay and taste what the valley has to offer! Virtual Tasting is Wednesday March 21 at 8 p.m. EST. Live from the Millbrook Winery in scenic upstate New York. Our next Virtual Tasting is Wednesday March 21 at 8 p.m. EST. RSVP now! Just a scant hour north of Manhattan lies the Hudson Valley, practically a suburb of New York City, where a world of wonders waits to be discovered. From artisinal cheese to heirloom apples, it is a region rich with traditional delicacies. Do you want to know the best thing about the Hudson Valley? Wine in the Hudson Valley has come a long way over the past decades. The vibe remains pretty much the same, think Sonoma circa 1960, but the wines are really evolving. While a decade ago hybrid grapes may have made the most successful wines, today we're looking at Chardonnay and Riesling, Cabernet Franc, Pinot Noir and even some groovy outliers like Tocai Friulano! Sound exciting? Well it is! What's even more exciting is that I'm going to be tasting some of the best wines live during Snooth's next virtual tasting. Join Carlo DeVito, author, emissary, winery owner and president of HudsonValleyWineCountry.org, and me for an hour of discovery and exploration as we talk about the history of the Hudson Valley and all that is making it one of today's most exciting and vibrant wine producing regions. Bring any bottle of Hudson Valley wine you can find! We'll be taking live questions about the Hudson Valley and the wines produced there. Come join the party next Wednesday March 21st at 8pm. We'll be waiting! Go here to link in! 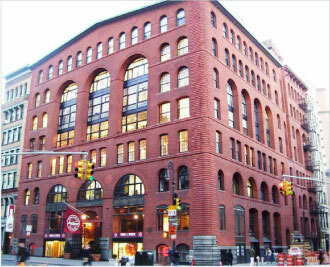 New York Drinks New York Grand Tasting at Astor Center Tonight!!! All over Facebook and Twitter people are talking about New York Drinks New York Grand Tasting at the Aster Center tonight. From the New York Times' Howard Goldberg to the widely published Amy Zavatto of Edible magazines fame, and to fans of local wine. The New York Cork Report will be retweeting and posting reviews of wine writers and fans there on the ground. Smart phones will be blinking plenty as Grand Tasting goers will tweet and post about their favorite wines or biggest surprises. Retweets and posts and facebook postings will continue during the course of the event. Tonight, at the GRAND TASTING writers and consumers will taste hundreds of wines from more than 35 New York producers from the Finger Lakes, Niagara Escarpment, Long Island, Hudson River Region and Thousand Islands. Tickets are not available at the event. THIS EVENT IS SOLD OUT! That is a success! For as long as I have been covering wines on the east coast, there has never been such a talked about tasting event of any east coast wine. And in our nation;s wine capital! This is the kind of event, and leadership, the New York wine industry has been hungering for...and here it is. Congrats to all involved from the NYWGF to the wineries themselves! I can't bellieve I am writing about Dornfelder. It's a handsell in the tastingroom and a tough sell at best in the retail store where your not there to sell it. But that said, I have made a turn around onDornfelder. Recently I tasted several in New York state that were nice. But I have finally found, on a recent trip to the California Central Coast, in the Santa Rita Hills, the best American Dornfelder above all. It's hard not to like Norman and Traudl. When Traudl was gravely ill, and needed a kidney operation to survive, it turned out a neighbor was a perfect match. The operation saved her life. 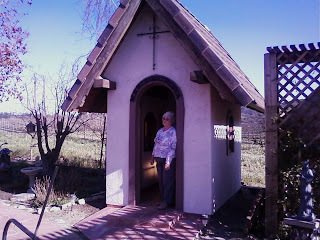 As a sign of gratitude Norman built a chapel in their back yard to give thanks. How can you not like that?! 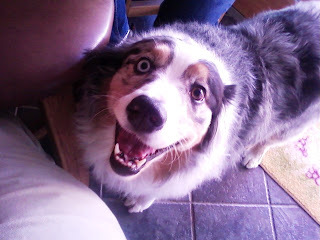 And they have an adorable and very happy Australia Shepherd named Hiedi! Norman Huber seems like a very nice man when you first meet him. He came to the US from Germany when he was 19 years old with his wife Traudl. Back before Norman spent most of his waking hours thinking about the challenges and joys of farming winegrapes, much of his time was spent with wood. Norman’s vocation has been as a woodworker, with such prestigious accomplishments as heading up the restoration project for the staterooms and restaurants on the Queen Mary, now permanently docked in Long Beach. Working with beautiful woods is extremely satisfying to him, and of course their home has a traditional ratskeller, crafted from woods from around the world. You can also see an example of Norman’s craftsmanship by visiting the tasting rooms of Longoria Wines and Fiddlehead Cellars, whose tasting bars were custom made by Norman. 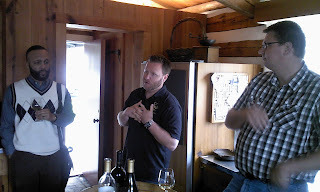 The Huber’s friends and neighbors at Babcock planted grapes and established a winery that was rapidly gaining attention for its Pinot Noir and Chardonnay wines, so those were the varietals first planted at Huber fifteen years ago. Maybe it was just luck, or maybe intuition, but back in those days most vineyards were further inland and away from the cooling influence of the ocean and the coastal fog. Since then, Santa Rita Hills has been recognized as perhaps the premier area in the United States for growing Pinot Noir and Chardonnay. Norman and Traudl originally hail from Germany, with family backgrounds in carpentry and farming. A few years ago, friends were visiting from Munich, and upon their return decided that a bit of the “old country” was needed in the vineyard, and sent a gift of certified nursery stock of Dornfelder vines. The vines flourished, and a little bit of the Chardonnay has been grafted over to Dornfelder each year. Grapes from the estate have always been used to produce great wines from Santa Barbara County wineries such as Gainey and Rusack, who continue to purchase fruit today. As with most vineyards, there was always a little wine made on the side – the estate wine. Beginning with the 2000 vintage, we decided to let a few others in on the secret and released the first commercial wine under the Huber label. The Hubert Vineyard Estate Dornfelder 2008 is an impressive wine. The nose is full of dark, dark stewed barries...blackberries, dark raspberries, and a hint of cassis. This is a big big, dark purple wine. On the palate is a lot of black cherry as promised, and then plum, prune, and cassis. Even a slight hint of apricot! This is a big, big full bodied wine. Can they grow this in the Finger Lakes? New Jersey? Pennsylvania? The Hudson Valley? Probably not, but every winemaker growing Dornfelder on the east coast should get their hands on a bottle of this wine. Done in oak, with malolactic. Big, mature, impressive. Waltz Vineyards was established in 1997 by Jan and Kimberly Waltz. Situated on a beautiful hill between Lancaster and Lebanon, Pennsylvania, their sixth generation family farm boasts a unique micro-climate and soils. In 2000, they created their first wine in their exterior garage. It was truly a "garage wine". Each year thereafter they tried to perfect the art of fermenting, blending and creating wines that were made only from hand picked, carefully selected fruit. In 2008, they decided to make their dream a reality and build their own winery! Their fun new facility utilizes the most modern wine-making technology imported from Italy. 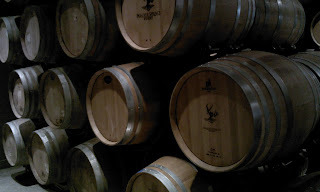 In addition, all of their wines are fermented in stainless steel tanks and aged in 100% French oak barrels. 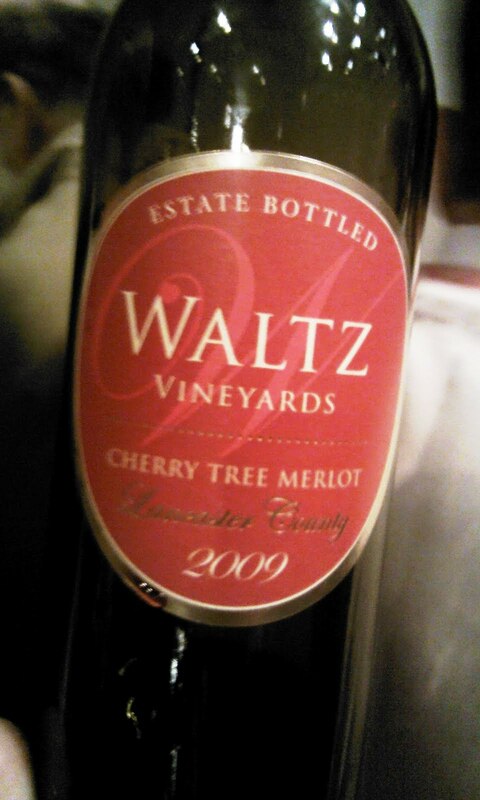 The wine of theirs that really wowed me was the 2009 Waltz Vineyards Cherry Tree Merlot. This is a new release. It's 78% Merlot and 22% Cabernet Sauvignon. The wine spent 16 months in French oak. They made 297 Cases. The colro was a deep, inky red, but still dark garnet, not purple. The nose on this wine was impressive right from the first. Ripe cherry came through first, with hints of chocolate & tobacco (as promised). The taste came through with ripe cherry, with hints of plum and a slight touch of cassis. Nice balabce between fruit, acidity and tannins, which were firm, but not aggressive. Nice spicy finish. This was a wonderful wine every bit as good as many Long Island or Virginia merlots. Very impressive. Congrats to the Waltz family. Just came back from the Eastern Winery Exposition. The weather could not have been nicer and the exposition hall couldn't have been any better. There were enough vendors so as not to be overwhelming and some really good seminars. Eastern Winery Exposition (EWE) is an Eastern-focused wine industry trade show and conference designed to provide the Eastern U.S. and Canadian wineries and vineyards with an easily accessible, low-cost professional meeting with a large number of winery and vineyard suppliers at the right time of year. A strong seminar program, exhibit hall featuring suppliers relevant to our region’s business of wine making, networking events, and state association participation are all integral components of EWE. 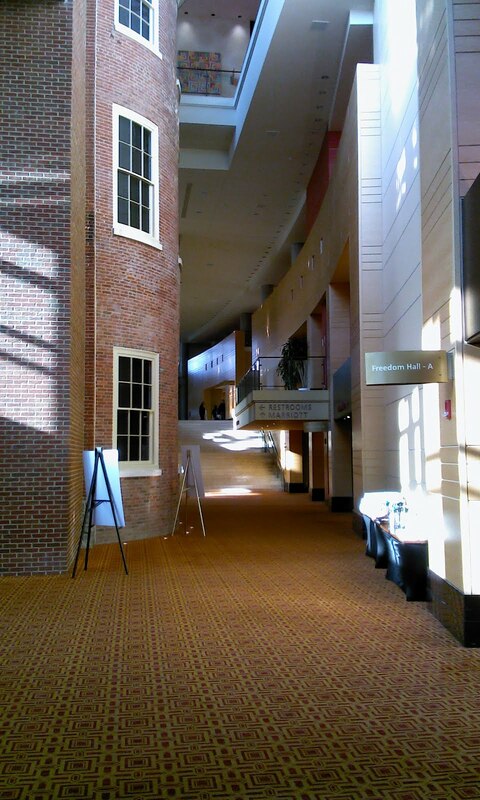 The trade show and conference is being held at a first class luxury facility, yet at an affordable price. 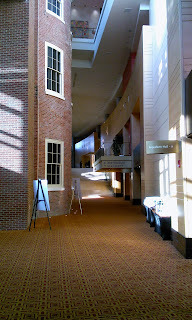 Lancaster Convention Center is conveniently co-located with the Marriott hotel. This two-year-old luxury landmark hotel features friendly elegance, impeccable service, remarkable architecture and many historic elements. A breathtaking lobby invites guests to gather as they view a magnificent interior street. Well-appointed guestrooms feature views of downtown and offer the most distinctive amenities commanded by the Marriott brand. While Eastern Winery Exposition is a new show, it brings together the combined expertise and experience of Bob Mignarri, Richard Leahy, and two knowledgeable and actively engaged advisory boards. Bob has 29 years of successful trade show management experience and has earned a reputation among exhibitors as someone who recognizes and understands their needs and concerns. 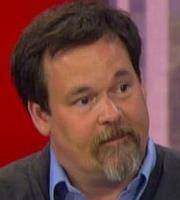 Richard Leahy is a renowned wine expert with 14 years of experience in developing quality conference programs. Together they have a proven track record in helping other eastern wine industry shows to grow and become more successful. The show started off with the usual - my favorite - the tasting reception. As in years gone by, there wre dozens of bottles on various tables, and one could easily walk around and sample. The bottles flew fast and furious, and the wine flowed freely. It was fun to be able to jump from Connecticut, to Ohio, to Pennsylvania, to New York and Ohio. The show, in Pennsylvania, for a number of east coast wine makers was filled with folks from New England, Pennsylvania, New Jersey and Maryland, and keynote speakers included those as well as from New York and Virginia. Many east coast personalities were there, such as Mike Fiore, Dr. Fiola, Adam McTarrart of Boxwood, the owners of Black Ankle, Ian Barry of the Keuka Springs Winery, Duncan and Robin Ross of Arrowhead Springs Vineyard, Lucie Morton, Juan Eduardo Micelli-Martinez of Martha Clara, wine writer Hudson Catell, Denise Gardner of Penn State, and many more. 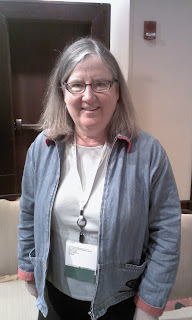 As with the old conference when it was held in Valley Forge, the Pennsylvania wine makers conference was held just before in the same hotel, so Pennsylvania was well represented. It was a good show. 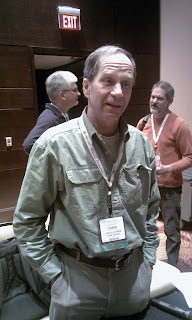 The seminars on winery cleanliness, on winemaking with hybrids and the other with cab franc were great. The Lucie Morton seminar was easilly the talk of the show. The online TTB seminar was incredibly informative as well. Of course the highlight of the event was the dinner where Hudson Cattell was awarded a lifetime achievement award for his service to the promotion of east coast wineries. A big, big, and well deserved moment. Easy to get to, and we got accomplished a lot in a short amount of time, and met with lots of nice poeple. The New York Drinks New York program, started by the New York Wine and Grape Foundation, continues its successes. This is a very important step in the evolution of the New York wine industry. Never before has New York produced so many good wines. But the cosmopolitan New Yorker seems virtually unaware. That is because New York is one of the two or now maybe three epicenters in the world of wine - London, New York, Hong Kong/Asia. New Yorkers have beein drinking wines from around the world since the colonists landed. Europeans unable to grow the grapes there were accustomed to for wine here in the states, simply turned around and ordered wines from back home. The New York industry lagged, especially with the introduction of Prohibition, which retarded the growth of the nation's nascent wine industry as a whole. But New York wine is emerging triumphant. Long Island and the Finger Lakes score in the high 80s and low 90s with regularity now (the Hudson Valley and the Niagara and Erie regions are emerging, too). And wine writers and media personalities acknowledge the quality and taste of these wines. But the industry in NYC is extremely competitive. Every country in the world has an office here (or an office that represents) and they each spend millions of dollars wooing wine and food writers (if you've ever seen what the Italians and other countries spend...whoa!). New York is way under-funded. Our industry is fighting Goliath with a proverbial slingshot...and let's be honest, more times than not, the guy with the slight shot lost until David. This new program, comeplete with a PR agency and a the city cab toppers is a good start. More importantly, it's about drawing in wine store owners, restaurantuers, and food and wine media types. It's not going to solve all our ills but we need to start gaining momentum. And it's programs like these that start that ball rolling in a way that a single vineyard or winery owner cannot. While the two big regions have mature regional branding groups, the other regions lack the fire power. That's why a state run program can do more good than anything else. In the end, each winery has to pull up their own boot straps. They need to make more quality wine, and shave off the underbelly fo some lesser wines. We need to come up with good packaging, we need to come up with good sales plans, and implement better marketing strategies. And we each need, in our own way, to push our product by walking into a store or restaurant, and sample wines for the decisions makers in our own areas, and then some. But the New York Drinks New York is just the kind of program other countries, and states (especially Washington and Oregon) are doing to drum up support for their regions. If you are skeptical about this program, you really don't know what the rest of the world is doing to sell their wines in this huge city. A number of wine writers have already expressed intrigue and excitement over the program. People are talking about New York wine. One can feel the buzz. It's a great program, and just what the doctor ordered. The real question, however, is - will New York wineries pick up the ball and run with it...or will they just stand there once the show is over. One hopes, they will take advantage of the tremendous opportunity! Last weekend's "Cellar Visits" by New York City wine writers, sommeliers, and wine store buyers were focused on Long Island, where on Sunday we learned that the Paumanok 2008 Late Harvest Sauvignon Blanc would be served that very night at the White House during the Governors' Dinner--a great way to get exposure nationwide for the superb quality of New York wines. 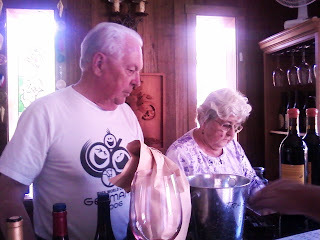 The tasting of that wine in Paumanok's cellar wowed the visitors, especially when wine maker Kareem Massoud explained that the wine's origin began with a rainy harvest and apparently rotten grapes; but his mother Ursula, from Germany's Pfalz region, identified the grapes' flavors as those of the great late harvest and ice wines from that country. Kareem took it from there, and the bottles bear a special (real) gold-etched label befitting the wine's golden color and luscious taste. There were many other high points of the two-day Long Island visit as well, including a great dinner at the Frisky Oyster restaurant (with "Oysters Friskafella") in Greenport, at the end of Long Island's North Fork where ferries whisk tourists to Shelter Island to get a second ferry that connects them to the Hamptons, where Channing Daughters and Wolffer Estate are located. One of the highlights of my trip was the Hilton Garden Inn in Riverhead, literally right at the end of the Long Island Expressway, where I bunked down the night before the group arrived. When I got there at 7 pm, there was a large, young, noisy crowd with live music, a $5 wine-tasting option presented by Pindar Vineyards and Duck Walk Vineyards, and I asked if this was a private party. No, just business as usual. When I checked in, I was given a half bottle of Duck Walk Cabernet Sauvignon and a corkscrew to take to my room, and noticed a large display advertising Long Island Wine Country tours for guests. I also took a look at the restaurant's wine list, which had lots of local selections, some of which I enjoyed with my dinner. In Watkins Glen, in the Finger Lakes, the Harbor Hotel does a fabulous job promoting local wines, which is part of the reason we hold our annual New York Wine & Food Classic there. But Hilton is a national chain, and national chains often require all wines to be centrally purchased--in other words, major brands with large quantities, mostly from California or Europe--so rarely do you see local wines. Fortunately, this hotel has a smart, loyal, business-savvy General Manager who understands that working together is good--and profitable--for everyone, and convinced "Corporate" to go along. It's good for busine$$. I highly recommend this hotel to anyone visiting Long Island wine country. I would also recommend Greenport as one of "The Coolest Small Towns in America". A month ago, as reported in a recent Wine Press, Hammondsport, at the south end of Keuka Lake in the Finger Lakes, tied for that honor, and with good reason. But Greenport is truly amazing as well, a tiny town with superb seafood restaurants, wonderful waterfront walks, and great places to stay. The final event in this phase of our "New York Drinks New York" program is a Grand Tasting on Monday, March 12 at Astor Center for the trade (1-5) and then consumers. All 38 participating New York wineries will be in attendance, sampling about 200 great New York wines. 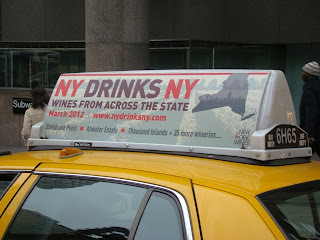 For more information, visit www.nydrinksny.com.